As a bride, you certainly want your wedding flower arrangements and bouquet to look gorgeous. Your florist wants it, too. We were discussing with some experts on this topic and here are few advices we want to share with you. Don’t be narrow-minded when it comes to flower types. It must be disheartening for both the bride and the florist, when she organizes a July wedding with her heart set on flowers that aren’t naturally available in July. If you don’t really know which flower types are naturally available on your big day, it’s better to stick to year-around available ones. Yes, it narrows your choice down, but keep in mind that there are a ton of breathtaking flowers you could choose from: orchids, callas, carnations, roses and hydrangeas are just some of them. Wedding flowers shouldn’t only be beautiful, but personal. 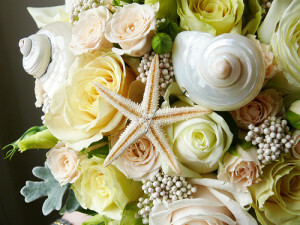 Incorporating something really special into the wedding centerpiece, bouquet and arrangements is also important. For example, if you’ve met your beloved one while on summer vacation, incorporate seashells into your wedding flowers to symbolize how you fell in love. Or, for example, include snippets from your mother’s wedding dress in your wedding bouquet. Wedding bouquet should be a priority. Flower arrangements are important, yes, but your bouquet is will be at your mom’s house, on your spouse’s desk at work or on your bedside table in photos for the next 60 years, perhaps. It’s important that you really like your bridal bouquet, not to skimp on it. As with other vendors, you should find florists you really like working with. Florists should be as excited as brides, you should have fun, have a good connection and be able to pick wedding flowers of your dreams. If you just didn’t get on well with one, try to find someone more appropriate and who will be able to meet your requirements.